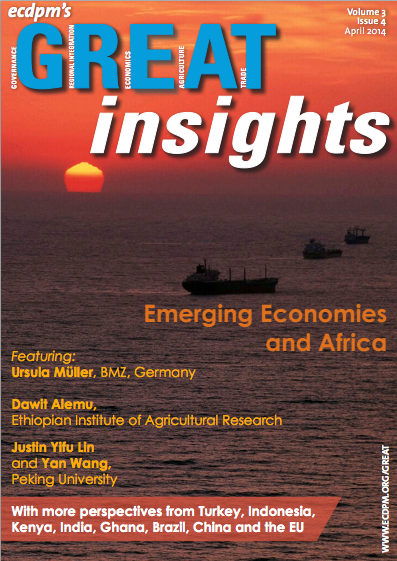 ECDPMGreat Insights magazineEast Asian lessons for Ethiopia’s Hailemariam and Kenya’s Kenyatta? 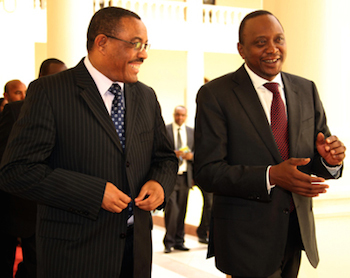 East Asian lessons for Ethiopia’s Hailemariam and Kenya’s Kenyatta? Fourie, E. 2014. East Asian lessons for Ethiopia's Hailemariam and Kenya's Kenyatta? GREAT Insights, Volume 3, Issue 4. April 2014. The new leaders of Ethiopia and Kenya must decide whether to continue their predecessors’ projects of emulating East Asian developmental states, warts and all. Last month, the two East African leaders met in Addis Ababa to discuss the deepening of bilateral ties. Over the course of four days, each expressed a commitment to regional security, to the newly ratified Special Status Agreement (SSA) concluded between the two countries, and to ambitious joint infrastructure projects such as Kenya’s Lamu Port-South Sudan-Ethiopia Transport (LAPSSET) Corridor. But while Ethiopia’s Prime Minister Hailemariam Desalegn and Kenya’s President Uhuru Kenyatta may well share a desire for deeper cooperation in these areas, the similarities between the two men run deeper. Each heads one of the region’s largest, most populous countries, in which the stakes for developmental success are at their highest. Each is untested and relatively new as a leader, with serious questions hanging over the ability and willingness of each to unite his country behind a common developmental agenda. And each succeeds a national leader who has attempted to forge such a common agenda by drawing lessons from a source that some will find surprising: East Asia. Hailemariam, as I discovered when I interviewed him in 2010, is keenly aware of his predecessor Meles Zenawi’s desire to create a developmental state that mirrors South Korea and Taiwan during their periods of fastest growth, as well as China today. At the time, my research uncovered widespread but highly centralised efforts by the ruling party to bring about the same rapid economic growth, political stability, investment in physical infrastructure, selective reform and industrial upgrading that was once famously associated with the ‘East Asian Model of Development’. These attempts at emulation were not limited to isolated policies or practices, but instead part of a broader paradigm that demonstrated to Ethiopian elites both the possibility and the necessity of rapid modernisation through structural transformation. In Kenya, too, Kenyatta is surely aware of the influence of East Asia on the highly ambitious programme of modernisation presided over until last year by erstwhile President Mwai Kibaki. Here the models were more often Singapore and Malaysia, countries held to have diverged greatly from Kenya in developmental fortune since attaining independence from the British in the 1960s. 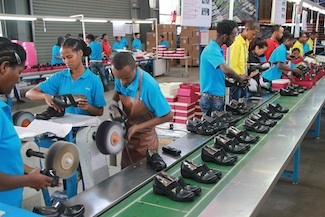 The lessons drawn were more market-friendly than in Ethiopia, with an emphasis on constructing developmentalist coalitions between bureaucrats and economic leaders through public-private partnerships. The lesson-drawing process also tended to be devolved away from politicians towards bodies such as the National Economic and Social Council (NESC) and those planners most heavily involved in Vision 2030, the country’s long-term development plan. But in Kenya, as in Ethiopia, East Asia provided policymakers with models of modernist developmentalism that are a far cry from the grassroots, participatory and institutionalist agendas that traditional donors often promote in Africa. There are wider implications in this trend towards South-South learning. The impact of new donors and emerging economies in Africa is not simply material—expressed through higher levels of foreign direct investment or changing flows of trade, for instance—but also ideational. 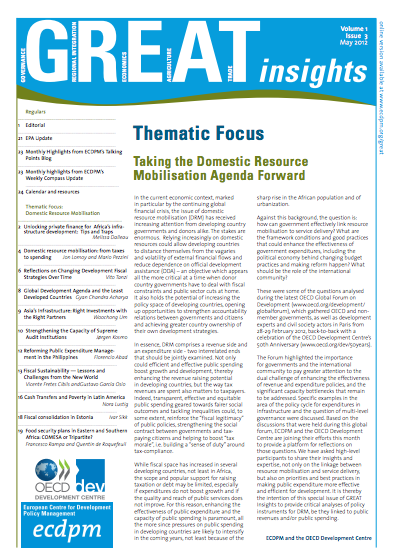 My findings also show that African policymakers do not always have to choose between ‘local’ solutions and foreign conditionalities, but that they may possess the agency to willingly seek out and domesticate policies that are seen to have ‘worked’ abroad, particularly in an era in which they have a greater choice in development partners. Finally, and perhaps most speculatively, my findings support the increasingly-popular notion that ‘African developmental states’ may not be the contradiction in terms that many once believed. Now both Hailemariam and Kenyatta are faced with the choice of whether to follow the same technocratic model as those who preceded them in office or to chart a different path. This has implications for the prominence given to lesson-sharing initiatives between these governments and their new partners in Asia, but has even bigger ramifications for development within Kenya and Ethiopia. The model under discussion certainly has both advantages and disadvantages. It has led to an upswing in economic growth, it is one of the factors behind the recent boom in physical infrastructure in both countries and there is some evidence to suggest—particularly in Ethiopia—that it can lead to broad-based improvements in areas such as maternal mortality and primary education. At the same time, it is associated with a lack of transparency, a preference for a top-down managerial approach and the suppression of dissent. There are signs that Hailemariam Desalegn does want to continue Meles’ lesson-drawing agenda, and that he was in fact hand-picked before the latter’s death in 2012 for precisely this reason. Kenyatta’s choice of model is more in doubt: a critic of Kibaki’s “hands-off” approach to the Presidency, he has already removed or reshuffled certain key emulators within the bureaucracy and has given less prominence to NESC. Even if each leader did choose to continue to draw lessons from East Asia, the question remains whether they have the capacity to do so. Developmental states are not easy to achieve, as continuing poverty, corruption and inequality in both countries suggest. The modernist visions of Meles and Kibaki remain unfinished at best. When Hailemariam and Kenyatta met in the Ethiopian capital to discuss the future of projects such as LAPSSET, they would have done well to remember the provenance of such grand schemes. Such policies are not isolated initiatives but are embedded within a broader vision of what it means to be developed and modern. It remains to be seen whether either man will join Africa’s much-heralded new generation of technocratic leaders, choose other models to follow, or allow the question to slip from his grasp entirely. Dr. Elsje Fourie is a Lecturer in Globalisation and Development at the University of Maastricht, The Netherlands.